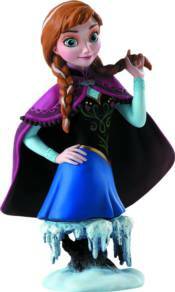 As impetuous as she is feisty, Princess Anna wants nothing more than to bridge the icy divide between herself and big sister Elsa, the future queen of Arendelle. But when Elsa reveals her hidden power and accidentally freezes the entire kingdom, it's up to Anna to venture forth into the wintry wonderland created by her self-exiled sister and bring Elsa back home to undo the damage she's unwittingly wrought. This character-authentic polystone mini-bust is designed by Patrick Romandy-Simmons and sculpted by Jacqueline Perreault. Standing 7' tall, Anna comes painted and ready to display.